Santana Terrell Moss (born June 1, 1979) is a former American football wide receiver who played in the National Football League (NFL) for fourteen seasons. He played college football for the University of Miami, where he earned All-American honors. Moss was picked by the New York Jets in the first round of the 2001 NFL Draft, where he spent 3 seasons with the team, before playing for the Washington Redskins for 10 seasons. Moss was selected as an All-Pro in 2005. Moss was born in Miami, Florida. He attended Miami Carol City Senior High, and played high school football for the Carol City Chiefs. He led the team with 25 receptions for 600 yards and 12 touchdowns as a senior, and amassed 450 yards on 12 kickoff returns with one return touchdown that year. Moss earned third-team all-state football honors following his senior season. Moss attended the University of Miami, and joined the Miami Hurricanes football team in 1997 as a walk-on, before being awarded a scholarship after the season's third game. He went on to break the Hurricanes' record (previously held by Michael Irvin) for most receiving yards (with 2,546 yards). He finished his 2000 senior season with 1,604 all-purpose yards, received first-team All-Big East Conference honors, and was recognized a consensus first-team All-American. Moss also became the first player to earn Big East Offensive Player of the Year and Special Teams Player of the Year honors in the same season. Moss is an important figure in Miami Hurricanes football history, generally considered (along with Irvin) to be one of the most accomplished wide receivers in the university's history. He graduated as the school's all-time leader in receiving yards (2,546), punt return yards (1,196), and all-purpose yards (4,394). Moss was interviewed about his time at the University of Miami for the documentary The U, which premiered December 12, 2009 on ESPN. He was inducted into the University of Miami Sports Hall of Fame in 2011. Moss was also a standout track athlete for the Miami Carol City Senior High track team. He was a two-time state champion in the triple jump and won state title in the long jump during junior season. He set a school record in the triple jump with leap of 14.81 meters. He also ran track for the Miami Hurricanes track and field team, and was named the "Most Outstanding Field Performer" for the 2000 Big East Outdoor Track and Field championships. He won the triple jump at the 2000 Big East Championships, with a personal-best mark of 15.50 meters. Moss was a first round (16th overall) pick in the 2001 NFL Draft by the New York Jets out of the University of Miami. In the 2001 season, Moss made his NFL debut in Week 10 against the Miami Dolphins. Moss made his first career catch in Week 12 against the New England Patriots. In the 2002 season, Moss made his first career start in Week 1 against the Buffalo Bills. Moss played a total of 51 games with the New York Jets and finished with 3,899 receiving yards, 19 touchdowns, 127 rushing yards, and 1,799 return yards. Following the 2004 season, Moss was acquired by the Washington Redskins in a trade with the Jets for former Jet Laveranues Coles. 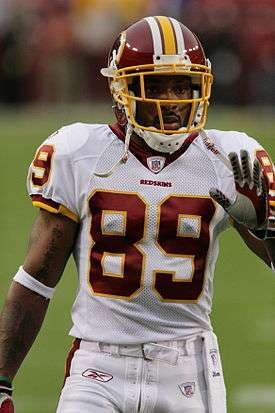 Moss signed a six-year contract with the Redskins on May 4, 2005. Known for his big play potential, Moss started the 2005 season off with a bang in Week 2 against the Dallas Cowboys, where he caught two touchdown passes of 39 and 70 yards from Mark Brunell in the last five minutes to come from behind and beat the Cowboys 14–13 on Monday Night Football. His 2005 season with the Redskins was the best in his professional career, with 84 receptions for 1,483 yards(second highest in the NFL that year, behind only Steve Smith of the Carolina Panthers), setting a new Redskins single-season receiving record. In 2005, Moss also was selected to his first NFL Pro Bowl. Moss recorded 18 rushing yards and 3 catches for 39 receiving yards at the Pro Bowl. Moss makes a mid-air catch in a 2006 game against the Falcons with Allen Rossum in pursuit. In the first three games of the 2006 season, he recorded only 13 catches for 188 yards. On October 1, 2006, however, Moss exploded for a season-high 138 yards on 4 catches, hauling in two touchdowns of 55 and 8 yards, as well as a 68-yard game-winning touchdown to give Washington the victory in overtime over the visiting Jacksonville Jaguars 36–30. Due to injuries that kept him inactive much of the year and less than 100% when he did play, Moss finished the 2006 season with 790 yards on 55 receptions. In the 2007 season, Moss started and played in 14 games and recorded 61 receptions, 808 receiving yards, and three touchdowns. In the 2008 season, Moss recorded over 1,000 receiving yards for the third time in his career. Starting in all 16 games, Moss recorded 70 receptions, 902 receiving yards, and three touchdowns. In the 2010 season, the last season of his contract with the Redskins, Moss recorded 1,115 receiving yards making this the fourth time in his career that he recorded over 1,000 receiving yards. He also achieved a new career high of 93 receptions as well as recorded six touchdowns. With his original contract ending, Moss re-signed with the Redskins. On July 26, the Redskins signed him to a three-year, $15 million contract that includes a $5 million signing bonus. He was made an offensive co-captain along with Trent Williams. In Week 7 against the Carolina Panthers, Moss suffered a broken left hand. He made his return to the field in Week 12 against the Seattle Seahawks. In Week 14 against the New England Patriots, Moss caught a 49-yard touchdown pass from wide-receiver Brandon Banks, the first of Banks' career. Working mostly out of the slot receiver position, Moss played and started 12 games and recorded 46 receptions, 584 receiving yards, and four touchdowns by the end of the 2011 season. During the preseason, it was reported that Moss lost 15 pounds to prepare for the 2012 season. After seven consecutive seasons of being a starter for the Redskins, his responsibility was reduced to more of a third-down slot receiver due to the team's additions of Pierre Garçon and Josh Morgan, who became the team's new starters. In the Week 5 loss against the Atlanta Falcons, he caught a 77-yard touchdown pass from second-string quarterback, Kirk Cousins. He would later score the only two touchdowns for the Redskins in the Week 7 loss against the New York Giants. In the Week 11 win against the Philadelphia Eagles, Moss caught a 61-yard touchdown pass from Robert Griffin III while under double coverage. During the 2013 offseason, Moss restructured his contract in order to clear up cap space. After the Week 11 game against the Philadelphia Eagles, he surpassed 10,000 receiving yards making him the seventh active player at that time to reach this milestone along with Tony Gonzalez, Reggie Wayne, Andre Johnson, Steve Smith, Larry Fitzgerald, and Anquan Boldin. Set to become a free agent for 2014, he re-signed on a one-year deal to remain with the Redskins on March 11, 2014. During a Redskins-Giants game on December 14, 2014, a touchdown in the closing seconds of the first half by quarterback Robert Griffin III was overturned by official Jeff Triplette after he saw that Griffin had fumbled the ball in the end zone. Moss angrily confronted Triplette and the officiating crew as they walked back to the locker room. An unsportsmanlike conduct penalty was assessed against Moss, and he was also ejected from the game, for which he heavily protested. He is the older brother of former NFL wide receiver Sinorice Moss, who previously played for the New York Giants during their win of Super Bowl XLII. He is also the older maternal cousin of Arizona Cardinals cornerback Patrick Peterson. In May 2010, The Washington Post reported that Moss allegedly received human growth hormones from doctor Anthony Galea. ↑ "Santana Moss resigns with Washington Redskins". wjla.com. Retrieved 2011-07-26. ↑ Jones, Mike (September 5, 2011). "Quick hits: 'Rex won by an edge'". WashingtonPost.com. Retrieved 2011-09-05. ↑ Jones, Mike (October 26, 2011). "Santana Moss could return in three to six weeks". WashingtonPost.com. Retrieved 2011-10-26. ↑ "Redskins vs. Patriots: Quarter-by-quarter breakdown, game's key play". WashingtonTimes.com. Retrieved 2011-12-11. ↑ Tinsman, Brian (February 28, 2012). "Roster Review: Wide Receivers". Redskins.com. Retrieved 2012-04-18. ↑ Sutton, Charles (June 1, 2012). "Moss and Armstrong Look for Larger Roles". WashingtonInformer.com. Retrieved 2012-06-12. ↑ Tinsman, Brian (May 21, 2012). "Cooley, Moss Trimmed for a Healthy 2012". Redskins.com. Retrieved 2012-06-12. ↑ Jones, Mike (September 2, 2012). "Santana Moss hopes reduced role with Redskins leads to increased impact". WashingtonPost.com. Retrieved 2012-09-11. ↑ Tinsman, Brian (October 7, 2012). "Cousins: 'I Tried To Do Too Much'". Redskins.com. Retrieved 2012-10-07. ↑ Tinsman, Brian (October 21, 2012). "Redskins Fall Short in Wild Finish: 23–27". Redskins.com. Retrieved 2012-10-21. ↑ Tinsman, Brian (November 19, 2012). "Moss Contributing To Offensive Renaissance". Redskins.com. Retrieved 2012-11-22. ↑ "Santana Moss Agrees To Restructure Contract To Remain With Washington Redskins". ↑ Tinsman, Brian (November 18, 2013). "Redskins-Eagles Monday Stats Pack". Redskins.com. Retrieved 2013-11-27. ↑ Jones, Mike. "Redskins re-sign WR Santana Moss". Washingtonpost.com. Retrieved March 11, 2014. ↑ "The Cardinals' Top Pick Was Raised to Succeed". NYTimes.com. April 30, 2011. Retrieved 2014-03-16. ↑ Maese, Rick; Svrluga, Barry (May 20, 2010). "Santana Moss received HGH from accused Canadian doctor, sources say". The Washington Post. Retrieved May 20, 2010.